It’s finally here, Google has finally taken the curtains off its Android 4.4 KitKat operating system, showing off all the goodness this new treat brings. In an event in San Francisco, Google introduced the latest Android operating system that is much cleaner and simpler before, making it the perfect mobile OS for every phone, even those cheap entry-level ones with a mere 512MB of RAM. On top of bringing a whole list of new stuffs with the new OS update from the design to the functionality, Google also updated Google Now and Google Hangout messaging app. First up, Google Now can quickly be activated from the launch screen, has an improved voice recognition, quicker searches, and more cards. Say goodbye to the default messaging app on Android because the new messaging app for Android 4.4 is now known as Google Hangouts; SMSes, instant message, voice and video calling are now done via a single app. 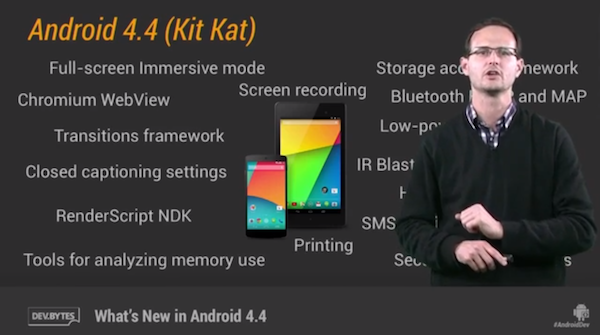 Android 4.4 KitKat is available immediately on the Google Nexus 5 and will be rolled out to the Nexus 4, 7, 10, and Samsung Galaxy S4/ HTC One Google Edition. Sorry Samsung Galaxy Nexus users, Google has already confirmed that it will not be available for your device because it “falls outside of the 18-month update window when Google and others traditionally update devices”.